A new drug called Stardust has been hitting the streets of Star City. 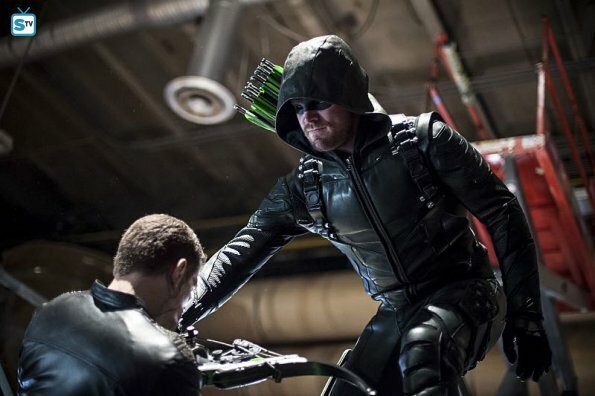 In order to catch the suppliers, Oliver makes a plan to use the Green Arrow to team-up with the city's officials to take down the criminals. But his vigilantes-in-training decide to take matters in their own hands, which results in a superhuman. Meanwhile, Thea makes her own mess of things at City Hall. The new team is still getting the hang of things, but I'm enjoying the wild ride (pun definitely intended). Rag-Man, aka Rory Regan, has officially joined the New Team Arrow. I'm too excited for words. (He's adorable. And oddly looks like Ezra Miller, who is going to play Barry Allen in the upcoming Flash film. Weird.) Evelyn still hasn't had much more development, which I'm a bit disappointed in. Wild Dog is at least learning something. And Curtis is being perfect and hilarious as ever. I loved watching him try to flirt with Rory the whole time. His mask was... interesting. Plus, we got a reference to Mr. Terrific! Unlike last episode, Diggle's side plot scenes were actually interesting. Mainly because they included Floyd Lawton (aka Deadshot). While he is still dead, I was glad to see him back--even if he was just a figment of Diggle's imagination. Also I found it interesting how much guilt is still hanging over Diggle for shooting his brother last season. It seems the writers are connecting season four and five seamlessly together with the events. (I love it.) I'm also glad that they're bringing Diggle's "adventures" to Oliver. While Oliver doesn't need another thing to worry about, I wasn't really interested in having a disconnected side plot about Diggle. Original Team Arrow seems to be suffering from the same symptom: guilt. Oliver feels responsible for Laurel's death, Diggle is responsible for Andy's death, and Felicity is experiencing guilt over Havenrock. (You know, the city Felicity dropped a nuclear warhead on in order to avoid hitting a more populated target.) I felt so bad for her at the end of the episode when she decided to come clean to Rory and tell him the truth. He didn't say anything at all, and she looked so heartbroken. Please, Felicity, don't let this hold you back. You're still awesome. Thea, while making mistakes, still continues to show growth. I cheered Thea on when she threatened the snotty news reporter for duping her. Don't mess with Speedy, people! Also, I was glad that Oliver finally accepted Quentin as his deputy mayor. I think it's going to be really important for Quentin do something good in the city again. Again, the flashbacks about Russia were on point with this episode. They connected with what Oliver and the New Team Arrow were facing. Plus, Bravta is interesting. Once more, this episode had a lot of awesome fight sequences and special effects. Basically: Oliver Queen is a total badass. He deserves an award. His new team should get something, too, for their hard work. Like ice cream. Oliver Queen has a new District Attorney since Laurel died. His name is Adrien Chase, and he is way too pretty and happy to be in politics. His sudden appearance and somewhat curious behavior makes me wonder what part he'll play in this season. Who is he? What does he want? Is he connected to something else going on? This episode was enjoyable. Arrow as I love it is definitely back this season! We have a lot already set up for a great season. More and more pieces are being revealed and falling into place. I'm thrilled for what's next. What did you think of "A Matter of Trust"?